"We've found that for people who are just graduating, it's more about the commute than the space," says Phil Lang, co-founder of TripleMint, a real estate brokerage and Brick Underground partner . "You don't care about how big the bedroom is because you're usually living at work," Lang explains. "And people who are just starting work are very concerned about face time in the office and making sure they're on call, especially in a very demanding field like finance." Need help finding the perfect starter apartment in the perfect neighborhood--or a landlord inclined to be flexible about guarantors, work history, rental history, or "flexing" your space with temporary walls? Put your search into the capable hands of Triplemint, a tech-savvy real estate brokerage founded by a pair of Yale grads in response to the frustrating apartment-search experiences of classmates and colleagues. Triplemint will charge a broker's fee of 10 percent of a year's rent on open listings instead of the usual 12 to 15 percent if you sign up here. Bonus: The agents at Triplemint are a delight to deal with. While the city's the least dangerous it's been in decades, safety's still a consideration, especially if you're moving to an unfamiliar area. 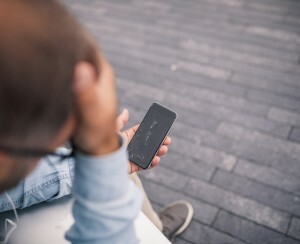 Due diligence is a must: Do your research, both online (tips on that here) and in person; visit a potential new apartment during the day and night to get a sense of what it's like at all hours and how well-lit and populated the streets will be if you're coming home late. It might look busy during office hours when you're not even in your apartment, and dreary and isolated at night. Safety tends to vary heavily by neighborhood—even block by block—so check in with friends who live in the area. Talk to potential neighbors in the building you're considering and ask what it's like; chat up locals at cafes and stores. And don't make judgments based on assumptions: Even in the most sterile stretch of midtown, it's not a great idea to walk around with your iPhone out or your headphones in at 1 am. These may sound like common sense tips, but they bear repeating. 1. Crown Heights (Brooklyn) Crown Heights is a hotter-than-hot neighborhood in Central Brooklyn that's exploded in popularity—and price—in recent years. If you cram into one of its many pre-war apartments with a crew of roommates, chances are your neighbors will be in the same boat. (The neighborhood has garnered so much buzz that it's sometimes branded as “ProCro” by over-enthusiastic brokers, though locals would never be caught dead using this term) . Culturally diverse, with a large African-American, West Indian and Hasidic Jewish population, much of this neighborhood still feels like a melting pot, with a wide range of restaurants and bars to match. Depending on where in Crown Heights you are, you’re close to Prospect Park, plenty of craft beer bars, and cheap eats spots, as well as several subway lines. 2. East Village (Manhattan) For those willing to spend more to get an “authentic” Manhattan experience (or simply want the convenience of being close to everything), there are still some enclaves of the gentrified East Village left for newcomers — but it’ll cost you an average $3,684 for a non-doorman two bedroom, according to the brokerage firm MNS. "The majority of apartments are walk-ups—five-story tenement buildings with small room sizes, so prepare for the space to be relatively cozy. However, many will charm with exposed brick and old world features," says TripleMint's Lang, observing that "while the East Village is somewhat lacking in amenities like gyms and supermarkets, it has more bars per capita than any other neighborhood." There are, in fact, more than 260 bars in the 14-block neighborhood, plenty of restaurants, and yes, cheap eats to make up for the high rent. The neighborhood is also served by several subway lines (6, N, R, F, L) and buses. That said, notes Lang, "the heart of the East Village in terms of restaurants and nightlife is really First Avenue/Avenue A, which is a little far from the subway, but most people are glad to make the trade." 3. Harlem (Manhattan) Generally speaking, the further north you go in Manhattan, the better the deals. As of this writing, East, Central, and West Harlem offer 184 listings with at least one bedroom (including a handful of three-bedrooms) asking $2000 and under, per Streeteasy — not bad if you're splitting the rent. Plus, the housing stock's architecturally interesting—brownstones stand next to graceful prewars and modern condos—and there are plenty of bars, restaurants, and nightlife. Boldfaced names have long been regulars to eateries like the iconic Sylvia's and the exclusive Rao's, but Marcus Samuelsson's Red Rooster has joined their ranks with its inventive fare. That's not all: In Central Harlem, Frederick Douglass Boulevard has new stores and cafes springing up seemingly by the week. And green space access is more than decent, with Central Park on the southernmost border at 110th Street; Morningside Park on the western flank, and Marcus Garvey Park due east. Moreover, says Lang, "subway access is one of the most important things college graduates look for, and Harlem can be fantastic because you can be near the express train to Midtown," with a commute of about 15 to 25 minutes to the West 40s, and 35 to 45 minutes to the Financial District. 4. Washington Heights & Inwood (Manhattan) Yes, these are two separate neighborhoods but they run along the same subway line next to each other, so we've combined them, given their popularity among artists, musicians, writers and other creatives. Inwood is sleepier of the two, though it's hard to generalize as swaths of Washington Heights—like Audubon Terrace in the 150s by Riverside Drive, for instance—have a similar genteel vibe. “Washington Heights has been a go-to for some time now and it’s still a value,” John Mazurek, of the Mazurek Team at Douglas Elliman, says. “You’re a slave to the A train, but one-beds in cool pre-war buildings can be had for $1,100 and 2 beds start at $1,950.” Washington Heights also tends to have more larger prewar buildings, which will likely have larger apartments. According to data compiled by AddressReport for BrickUnderground, the nightlife is nothing to write home about, though, with only 45 bars, making the population-to-bar ratio 2,554:1. (For reference, the East Village has 263 bars, making the bar-to-population ratio only 340:1. Beers all around!). That said, there's certainly peace and quiet, and enough watering holes for a quick drink with friends before heading home (not to mention a faster commute than you'd have in a lot of outer-borough areas). 5. Bedford-Stuyvesant (Brooklyn) While this Brooklyn enclave is often talked about for the skyrocketing sale prices of its signature brownstones, Bed-Stuy—which is bordered by Bushwick to the north, and Clinton Hill to the south—has become a hugely popular option for young renters, too. Its local wine bars, cafes, and restaurants like Saraghina and Peaches Hot House, part of a veritable United Nations of food choices like Caribbean, Southern, and even Senegalese, are luring plenty of fans, says Ronica Webb, a real estate broker with Brooklyn’s Realty Collective. And there are plenty of financially feasible availabilities: As of this writing, there are, according to StreetEasy, 16 two-bedrooms under $1,700; around 120 studios and one bedrooms: and about 300 two-bedrooms that are shareable for roommates paying anywhere from $800 to $1,200 apiece. Depending on where you live in the neighborhood—and whether your nearest train is the reliable A or the beleaguered G—transportation is hit or miss. This is a neighborhood best navigated by bike, or by the numerous local buses. 6. Clinton Hill (Brooklyn) Wedged between Fort Greene, Bed-Stuy, and Prospect Heights, Clinton Hill was another tony turn-of-the-century neighborhood for affluent New Yorkers. These days, it’s home to everyone from Pratt Institute students to professionals to young families, lending it an artsy, effortless vibe. It’s not a superlative — you won’t find the most of anything here (there are around 50 bars in the area, for instance), but that's all part of its laid-back charm. It’s scenic, pretty, and very safe, with an average of one crime per 1,000 residents. In addition to low-key local favorites like Emily and Outpost, it's an easy walk to neighboring Fort Greene, meaning there are plenty of dining-out options, not to mention access cultural institutions like BAM and BRIC. 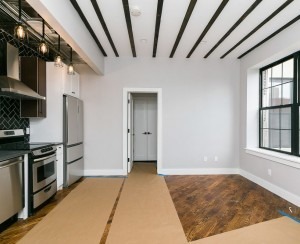 As with Bed-Stuy, you'll be reliant on either the A/C or the G.
Another Brooklyn spot with high inventory and relatively low asking rents is Bushwick, which borders Williamsburg to the west and the Queens neighborhood of Ridgewood to the north. “Bushwick has been a destination for a while now as people flood over from Williamsburg and Greenpoint,” Mazurek says. “Good subway access along the JMZ and L lines and you can still find renovated three-bedroom apartments for $2,800 a month.” While this neighborhood is known for being an artist’s enclave (and thus has arguably some of the best coffee shops and galleries in the city), it also has a more serious crime problem, with more than 1.5 crimes per 1,000 people, per the NYPD crime map, about 50 percent more crime than other Brooklyn neighborhoods. But if nightlife is what you're after, you can't do much better—a new bar or restaurant opens in the neighborhood seemingly every week. Transportation is the linchpin for most new grads, since no one wants a three-subway transfer just to get to work. Enter the unlikely MVP of Sunset Park. “It’s bursting out,” Mazurek tells us, noting the D and N express trains and the local R lines. And thanks to more than $1 billion in funding from Industry City, the Silicon Valley-esque tech incubator in Sunset Park, expect to see this post-industrial neighborhood boom in the coming years thanks to an influx of tech and startup jobs, per Capital New York. And with hip nightlife hotspots like Hotel BPM, a music-themed inn, expect a more robust nightlife scene to develop. In the meantime, drinks with friends can be sought elsewhere, or had at one of 29 bars in the entire neighborhood (relatively low in comparison to other areas), according to AddressReport. Still, “rents right now in the area are still very affordable,” Mazurek says, with a typical three-bedroom asking around $2850, or $950 per person. “I’m from Bay Ridge! We have manners!” laments an indignant Peggy Olson in season 1 of AMC's Mad Men.” But it's more than polite now. The same sleepy waterfront neighborhood that gave birth to the fictitious secretary turned creative tour-de-force is also an unexpected sleeper hit for post-grads hoping to make it in the big city. (A bonus: It's got very little crime to speak of). With plenty of pubs, charming old-school restaurants and a burgeoning crop of cocktail bars, there’s something for everyone. Downside? It’s the last stop for the often-problematic R train, so that could be a deal-breaker if seamless subway access is your jam. Once a middle-class neighborhood of predominately Irish, Italian, Israeli, and Greek immigrants, Astoria is now a haven for young working professionals, thanks in part to a bustling downtown and relatively lower rents (though they're rising as the area continues to get attention). That's in part thanks to a convenient commute into Midtown via the N and Q trains, which takes only a half hour. And once you get here, it's hard to leave, not only because of the charming, true neighborhood-y feel, but because of the gastronomically diverse and delicious food options (hat tip to Time Out's food guide) like Greek, Egyptian, and a whole host of coffee shops, bars, and pubs, not to mention, its own winery. Plus, a runner-up: An entry on last year's list of college-grad-friendly neighborhoods, Ridgewood, Queens is still a contender, with its large apartments and proximity to Bushwick and East Williamsburg, it's attracting hipsters and artist types priced out of those areas. 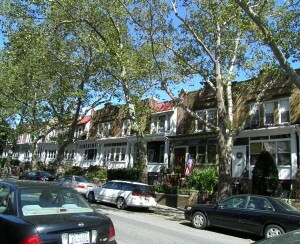 Many buildings were developed in the early 20th century, keeping an old-school feel to the area, and there’s a large supply of row houses, many on serene tree-lined streets. But the subway options are limited, so test out your commute to see if it's doable. TIP: Need to stretch your budget? Sign up here to pay a lower broker fee using a broker from BrickUnderground partner TripleMint. Founded by two Yale grads to provide a better rental search experience, TripleMint typically charges around 10% of a year's rent versus the standard 12-15%.